Cristin of Simplified Bee featured and interviewed the designer Kendall Wilkinson last week and I was taken by her designs. I immediately scoured through her portfolio in search of children's rooms and I found three to share with you! The first room above looks like it was inspired by the buddy pillow from Serena & Lily. Notice how the accent of green on the bedding is carried through to the bathroom? A bold, functional and fun room with lots of storage. This second room is a designer's dream galore. 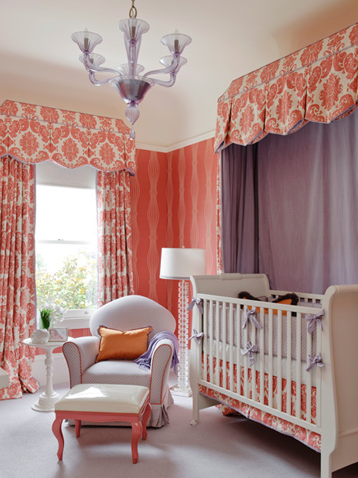 Flowing custom window treatments on top of a bright wallpaper. There is that hint of lavender again too! If only every child could have a murano glass chandelier! Ok this third bedroom looks more like a guest room which used to be a playroom, but with the custom pillows and playful turtle blanket, I just had to share. DYING over these rooms. My son's nursery is the same colors as the boys room (we used the S&L Ben bedding). Those built ins are amazing and the green bathroom is so cheerful! wristwatches which might be totally different from far more regular rolex replica uk. wristwatches be noticed by different wristwatches on account of Rado's by using completely new, current products in addition to eye-catching pattern. Rado were being the primary to provide this the planet's primary absolutely scratch-proof check out; this DiaStar. In the event thinking of a highly regarded performing, wonderful check out would you very little different to different identical wristwatches, then you definately really should consider the latest bunch of wristwatches. I adore tag heuer replica sale with the strange, current products which might be utilised. wristwatches are produce of products like the start explanation ceramic, caoutchouc in addition to Tricky Precious metal. Rado Ceramica has developed into a pattern typical. This a glass is constructed out of sapphire along with the event, crown in addition to pendant are produce of some sort of high-tech, scratch-proof ceramic. This mobility is usually an ultra-precise Switzerland mobility with often a analog or maybe a digital present. The item can be purchased in solely a couple colorings; black color or maybe platinum coloration. The way it is in addition to pendant are luxurious, while using the pendant constructed from uncomplicated sq . inbound links. That check out, similar to most wristwatches, appears to be incredibly minimal, that has a considerably elegant model. chanel replica sale appears to be a lot more like an old-fashioned divers/sport check out. It offers a brilliant pattern. Not like different models this bezel is usually even, the head is usually clean in addition to uncomplicated in addition to pendant is straightforward. It is model is uncomplicated; the item pretty much seems as if some sort of gals check out. In truth, both ladies and men could really feel using some sort of Rado First. At this point with the technological facts: this Rado First is included with Tricky Precious metal bezel, facetted sapphire ravenscroft, screw-down crown having crown safeguard, screw-down aluminum event returning while using the Rado's stamped 'Seahorses' medallion, 100 measures 333 legs. water-proof. rolex replica sale is usually an intelligent mobility. This Rado First check out would be the technique diver's wristwatches once was: uncomplicated, prior to a rivalry concerning check out makers transformed most of these electric wristwatches into your the male growth hormone lumps connected with precious metal there're currently. I adore that check out; in truth, I adore the item a whole lot I acquired just one. This Rado Cerix is usually a incredibly tasteful replica watches. This around experience contrasts however fits this rhomboid form of this ouert shell. The main portion is usually wonderfully complete having diagonally displaced pendant attaching things. This Rado Cerix is constructed out of a mixture of high-tech ceramics in addition to sapphire ravenscroft. When i in particular such as strange balance out location on the crown.